Gentle persuasion?Join thousands of others and subscribe to Computers in Classrooms free! More prize draws coming up -- details soon. 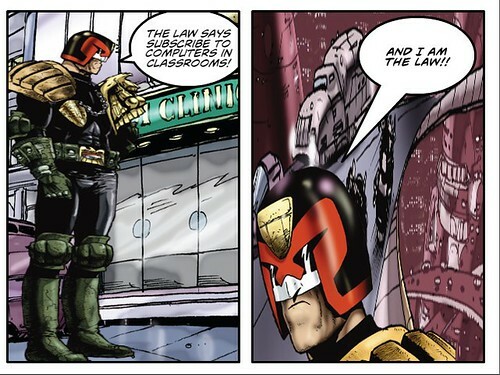 I've used a comic book character -- Judge Dredd -- to advertise my newsletter. How else might you or your students use this sort of approach? Here are seven ideas. Warn against leaving your login details lying around. Advertise a new school visit. Encourage students to enrol for an IT course. Describe the dangers of smoking. Use as the basis for a caption competition. Use on the front cover of a trouble-shooting guide. I realise that there is a danger that using a comic book character to illustrate a serious issue could end up trivialising the issue. My response would be that years and years of serious graphic novels says otherwise. But in any case, shouldn't learning, and the learning environment, be fun? The image above was created using ComicBrush in accordance with its terms and conditions.